Nominate a local volunteer hero for a Citizen of the Year Award! Deadline is April 15, 2019! At Maple Ridge Community Foundation, we’re passionate about connecting people, ideas and resources through community philanthropy. 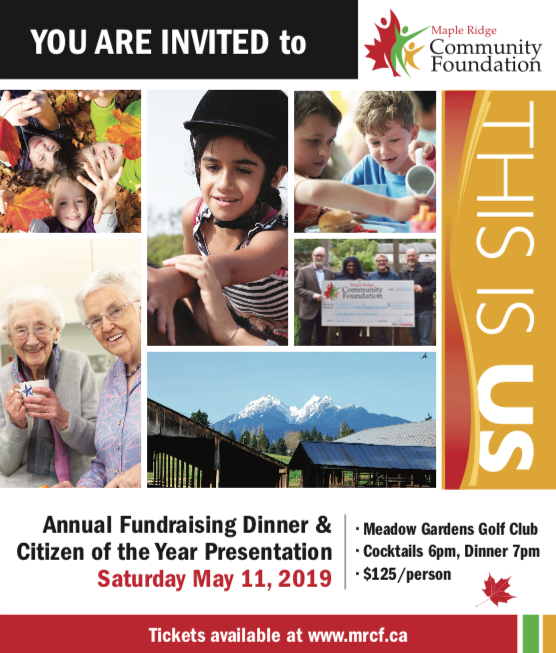 The Maple Ridge Community Foundation is a public foundation established by, and for, the people of Maple Ridge. We work to make giving easy by providing ways to connect donors with causes that matter in their own community, and by facilitating individual, corporate and foundation philanthropy. As an independent charitable organization, our only limit is the will and the imagination of our donors. A gift of any amount creates a legacy that addresses the needs of our community today and tomorrow. We believe in the power of individuals, charitable organizations and corporations working together for positive change, and we invite you to join others who care about Maple Ridge. Please explore our website and learn how you can get involved in making a difference in your community. Please feel free to contact us with any questions you may have, or to arrange for a private appointment. We look forward to working with you. A healthy and vital community in which all people have the opportunity to enhance the quality of their lives and the lives of others. The following promotional video was prepared for us by a 15 year old student who graduated from the film program at the Greg Moore Youth Centre. Thank you, Elijah!